The Diocese of Mandya was erected by His Beatitude Varkey Caradinal Vithayathil, the then Major Archbishop of the Syro-Malabar Church, by his decree of erection Prot. No. 55/2010 on 18th January 2010, bifurcating the diocese of Mananthavady, after having obtained the consent of the Synod of the Bishops of the Syro-Malabar Church and the Assent of His Holiness Pope Benedict XVI. The Major Archbishop, Varkey Cardinal Vithayathil, by his decree Prot. No. 56/2010 of 18th January 2010, has also appointed Rev. Msgr. George Njaralakatt belonging to the diocese of Mananthavady as the first bishop of this newly erected diocese. The eparchy of Mananthavady was erectd by His Holines Pope Paul VI, by the Bull Quanta Gloria of March I, 1973 bifurcating the vast diocese of Tellicherry. The eparchies of Tellicherry and Mananthavady were erected for the migrated people from the central Kerala. Population explosion and the shortage of food during the post war period (1945-1960) induced them to migrate to the uninhabited fertile lands of northern Kerala and to some isolated pockets of Tamilnadu and Karnataka States. These places were filled with thick forests and under the threat of malaria and other diseases. The migrated people, being agrarian, risking their own life cleared the forests and settled themselves cultivating paddy, rubber, coconut, coffee, cashew, pepper etc. The eparchy of Mananthavady was comprised of the civil districts of Wayanad and parts of the civil districts of Malappuram and Kannur in Kerala, the Nilgiris district in Tamilnadu and the districts of Shimoga, Chickmagalore, Hassan, Mandya, Mysore and Chamarajanagar in Karnataka. The parishes under the Manimooly Forane in Malappuram district and some parishes under the Peravoor Forane in Kannur district were later added to eparchy of Mananthavady on 31st December 1975 by the Oriental Congregation. Shimoga Mission Region which was entrusted to the Missionary Congregation of the Blessed Sacrament (MCBS) was erected as the eparchy of Bhadravathi on 21st August 2007 appointing Rev. Dr. Joseph Arumachadath MCBS as the first Bishop. Later on 18th January 2010 the district of Chickmagalore was added to the diocese of Bhadravathi. 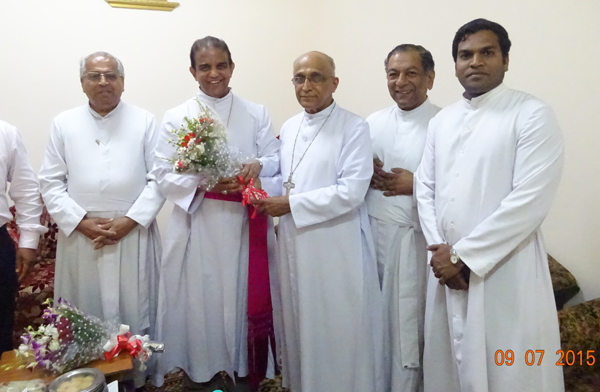 The district of Mandya was entrusted to the pastoral care of the Missionary Society of St. Thomas (MST) and the district of Hassan was entrusted to the Congregation of the Carmelites of Mary Immaculate (CMI). Mysore and Chamarajanagar districts were under the direct pastoral care of the eparchy of Mananthavady. After the erection of the eparchy of Mandya all these mission regions come under it. The eparchy of Mandya is a suffragan of the Archdiocese of Tellicherry. Mar Jacob Thoomkuzhy, the first bishop of Mananthavady was consecrated on 1st May 1973 and he guided the diocese for long 22 years. He was transferred to the eparchy of Thamarassery on 7th June 1995 and later to the Archdiocese of Trichur on 8th December 1996. On 26th January 1997 Bishop Emmanuel Pothanamuzhy CMI was consecrated as the second bishop of Mananthavady. He served the diocese only for six years. 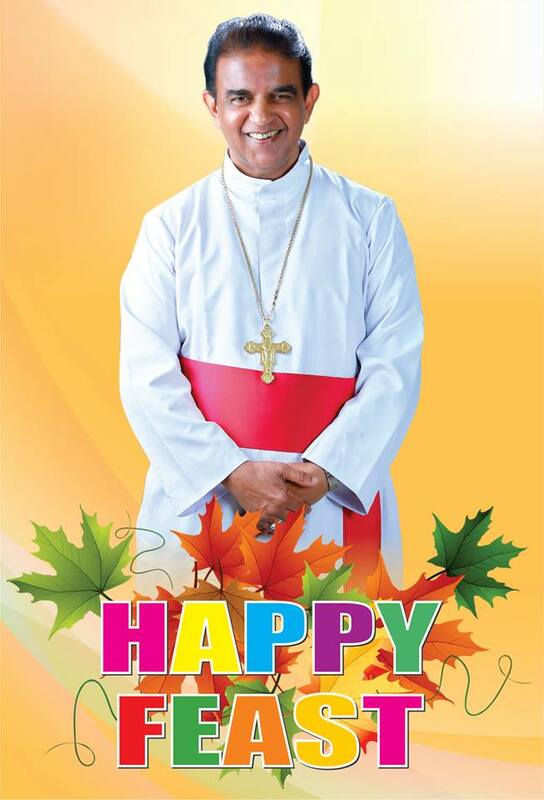 After his demise on 6th April 2003 Bishop Jose Porunnedom, the present Bishop, was appointed on 18th March 2004 and was consecrated as the third bishop of Mananthavady on 15th May 2004. From 1954 onwards the CMI fathers of the Sacred Heart Province of Kalamassery were working in Mysore under the then diocese of Tellicherry. The formal erection of the ‘Mission Region’ under the CMI was in 1965. In 1973 the diocese of Mananthavady was erected bifurcating the then diocese of Tellicherry and Mar Jacob Thoomkuzhy was appointed the first Bishop. In 1981 in order to facilitate the mission work of the district of Hassan, a contract was made between His Excellency Mar Jacob Thoomkuzhy and the then Prior General of the CMI Congregation. Thus the Hassan district was entrusted to St. Paul’s province of CMI, Mysore. Till the erection of the new diocese of Mandya they were rendering their service in Hassan. The CMI St. Paul’s Province has its headquarters at Mysore and they have some houses in the Mysore district. And the CMI fathers of St. Thomas Province, Kozhikode were working in the district of Chamarajanagar from the very beginning of the diocese of Tellicherry and they have two houses in the district. In 1978 by a mutual contract between Bishop Jacob Thoomkuzhy and the then Superior General of the Missionary Society of St. Thomas the Apostle (MST), the district of Mandya was entrusted to the MST fathers for missionary apostolate. The dedicated, selfless and hard work of these fathers enabled the growth of the mission. Today what the diocese of Mandya has in Mandya district is the result of the hard work of the MST society. They have handed over to the diocese 11 Mission stations with all the movable and immovable properties there in. Sisters belonging to different congregations such as SH, FCC, MSMI, MSJ, SCS, SKD, SMS, CMC and CHF also worked here hand in hand with the fathers for the growth of this mission region. From 1980 onwards priests from the diocese of Mananthavady were working in the Mysore district. The parishes, including the Cathedral church, and mission stations in Mysore districts are results of their dedicated service and hard work of these fathers. 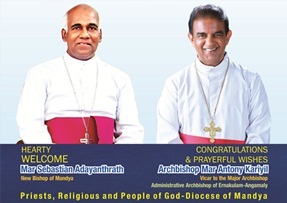 On August 29, 2014 Bishop Mar Njaralakatt was elected by the Holy Synod of Syro Malabar Church as the Metropolitan Archbishop of Tellicherry as Archbishop Mar George Valiamttam tended his resignation upon reaching his retirement age. Bishop Njaralakatt was installed as the Archbishop on October 30, 2014 and assumed office on the same day. On Nov 2, 2014, Rev. Fr. George Alukka was appointed as the administrator of the diocese by Cardinal George Alenchery as suggested by the permanent synod of the Church. Administration of the Diocese of Mandya was vested with administrator till the new bishop Antony Kariyil CMI was appointed as the second bishop by the Church on 26 August, 2015, extending the territories of the eparchy up to Bengaluru. Bishop Kariyil was consecrated on October 18, 2015 and assumed the charge on the same day. The Diocese of Mandya which comprised of four civil districts of Mysuru, Chamrajnagara, Hassan and Mandya has been extended to include the six civil districts of Bengaluru region: Bengaluru urban, Bengaluru rural, Kolar, Ramnagara, Chikkaballapur and Tumkur. The catholic population of the diocese is above 1 lack. 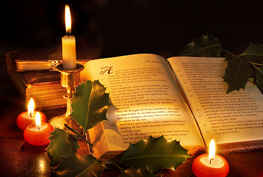 There are considerable number of Catholics belonging to the Latin dioceses of Bangaluru, Chickmagalore and Mysore. The rest of the population is mainly Hindus, Muslims, and people belonging to SC, ST. The Catholics of the diocese are mainly migrants from different part of Kerala. They came over here mainly in search of job opportunities, business and agriculture.